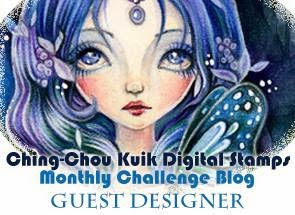 I don't know if any of you knew this but I was picked to be Guest Designer this month over at Ching Chou Kuik Digital Stamps Challenge Blog!! And I am so excited to show you what I made!!! I fell in love with this image the minute I saw it!!! Its just so sweet and pretty!!! The image is called Spring Dreaming and I colored it with copics. I tried to use really soft gentle colors because to me that's what spring is a gentle awakening of all things pretty and colorful! I used some Bo Bunny "Sweet Life" paper and some flowers and embellishments from my stash. I hope you like this card and it makes you start thinking of warmer weather and spring blossoms! I can't wait to see what you all create for this challenge! !